Product #18716 | SKU LP36776 | 0.0 (no ratings yet) Thanks for your rating! 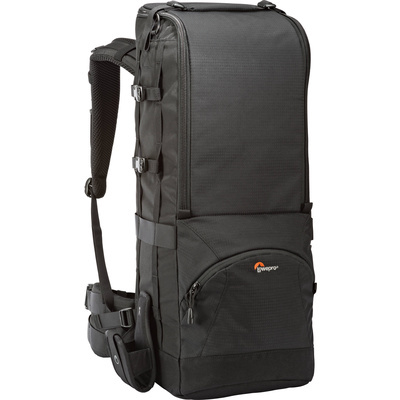 Carry and protect your pro DSLR and attached 600mm f/4 or unattached 800mm lens with this black Lens Trekker 600 AW III Backpack from Lowepro. The bag has room to accommodate the lens hood, and also fits a tripod. It features a shock-absorbing foam interior with padded dividers and a lens collar, as well as a durable 630D Oxford nylon exterior. A built-in, weather-resistant cover and 1000D Cordura base protect your gear from the elements. Adjustable ergonomic shoulder straps and a removable padded waist belt make for comfortable carrying. Holds pro DSLR and attached 600mm f/4 or unattached 800mm lens with hood. Also fits a tripod attached to either side. Features a shock-absorbing foam interior with padded, adjustable MaxFit System dividers and a lens collar. Main compartment accessible via large zippered flap that opens and drops down to allow you to grab or rearrange your gear quickly. Includes 2 memory card pockets on the inside lid. Durable 630D Oxford nylon exterior. A built-in, weather-resistant cover and 1000D Cordura base protect your gear from the elements. Adjustable ergonomic shoulder straps and a removable padded waist belt make for comfortable carrying. The contoured ActivLift System torso harness, built for load-lifting support, is adjustable and has breathable mesh for comfort. It allows you to transfer more weight from waist to hips via metal wire frame. Sturdy Duraflex D-rings and SlipLock loops enable accessory attachment, expanding your carrying capacity. Cinch straps to secure a jacket, tool, or personal gear.